As the Leeds EDL demo turned out to be the dampest of squibs here’s a repost from Contra Info – Translation counter infomation network instead. As far as i’m aware no AFN affiliates went to Leeds, as there is not a group there for us to support. If this is not the case please get in touch, or feel free to write a report. Click on the Contra Info link above to see videos. Looks as though the fascist march was allowed to roam freely whilst the small group of antifa’s was kept under heavy manners from plod. Still, a good report. Solidarity with all antifascists! 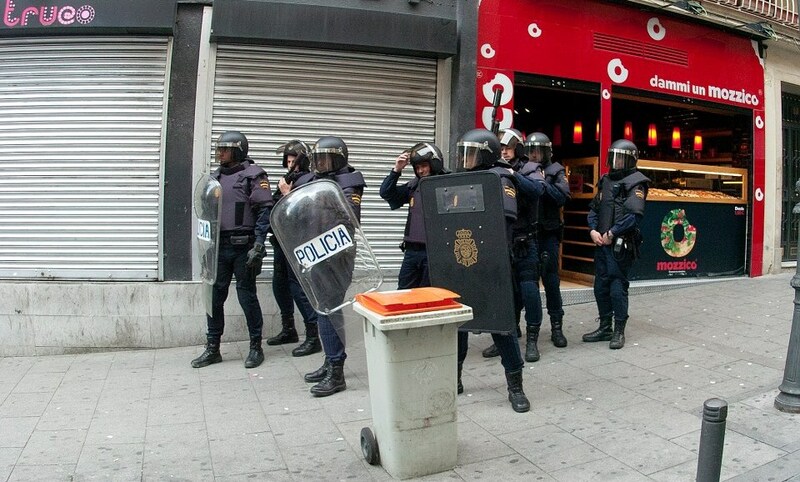 At 6pm on May 1st, various fascist organizations, every one cheesier than the last, called a demonstration that began in Tribunal, a central area in Madrid, very close to Chueca. 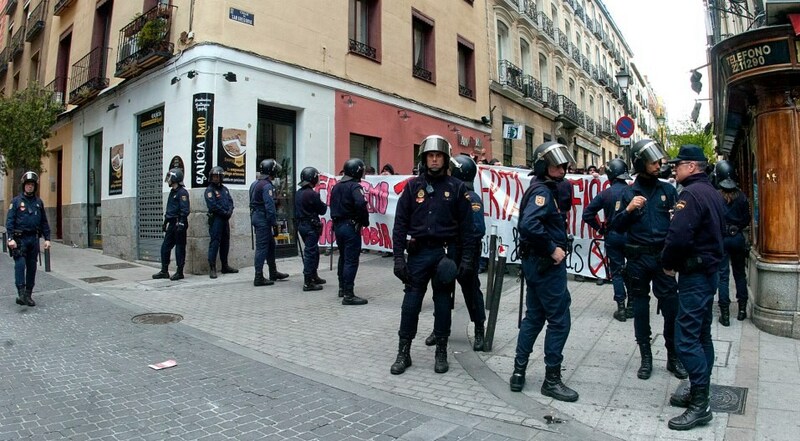 On the same day, at 5pm, an antifascist gathering was called in the Plaza de Chueca. The call was put out just a few days in advance, and it was unknown what response it would bring. 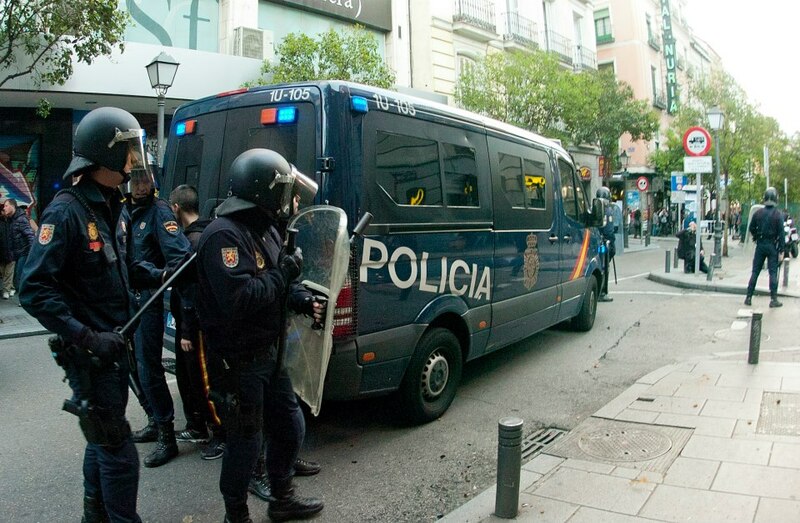 Well before 5pm, there was already a large police deployment in Chueca, and the antifascist gathering was surrounded from the beginning. The strategy seemed clear: To wear out the counter-protesters and keep them there until the fascist demonstration would be over. But the shouts, good humor, resistance, and dignity didn’t wear out, and the comrades stayed united and combative while surrounded by police for two hours. Around the edges various groups went around and around without being able to join the gathering, but waiting the whole time for the group of their comrades and the fascists. 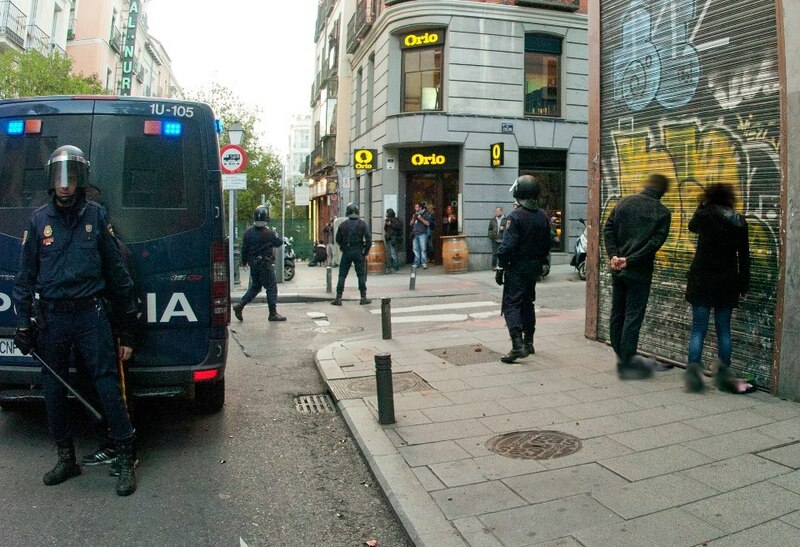 When all those who were in the gathering in Chueca got out after being frisked, having their IDs checked and (for many) being photographed, some of them met up with other groups that were outside the cordon and headed to Tribunal, where there was a scuffle with the police and two comrades were held. Since it looked like they were going to be detained, the rest barricaded the street and pulled stones from a dumpster to throw at the cops. The cops charged hard, shooting rubber bullets and chasing the demonstrators, detaining one person; we don’t know if this person was with the group or not. The two comrades who were held earlier have been released, but other detentions were added to the tally in the Plaza de Jacinto Benavente, far from the gatherings and long afterward. Against the system, democratic or fascist. For anarchy.